On paper, the eight points Derby gained in their last five games suggest a solid but unspectacular March. In reality, it was an emotional rollercoaster – even by our bonkers standards. We started by conceding four, and ended by scoring six. Inbetween there were goal of the season contenders, Frank admissions, and palpable relief that a late-season crumble has been averted. Despite three defeats on the bounce, there was quiet optimism before Villa away. The home side had one of the worst home defensive records in all four divisions and had won two in 14. We were due a performance. Derby’s shellshocked players come to terms with the horror first half at Villa. Nobody seemed to tell the players this, however, and in-form, Grealish-inspired Villa tore Derby a new one in 45 bewildering, nightmarish minutes. Lampard at least learned about his squad on that torrid afternoon in Birmingham. Wisdom, Evans and Jozefzoon all started, but none made a case for keeping the shirt and Evans was even hooked at half time. The low point of the season, and Lampard has since revealed strong words were said in a team meeting afterwards. 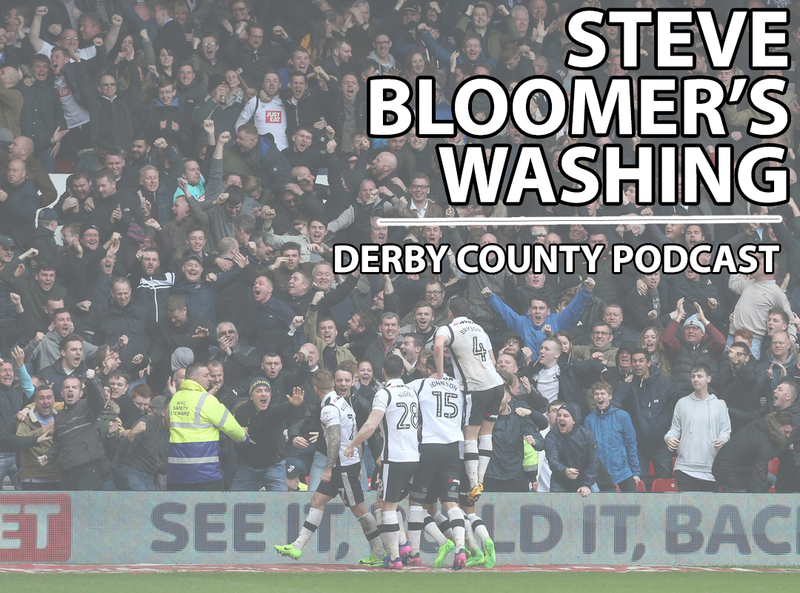 Thankfully, Derby seemed so ashamed of this ‘performance’, it motivated them for the rest of March. The Rams’ reaction wasn’t immediate – and when Wigan nicked the lead in the next game, we faced our biggest test of character this season. It also takes moments of magic or blind luck to stop the rot sometimes – the jury’s still out on which one Mason Bennett’s goal was. His acrobatic, reverse-volley-bicycle-kick defied logic and physics, and still baffles me now. All that matters is that it flew in, the Rams got their tails up, laid siege to the Wigan goal and got a deserved winner when Scott ‘spaghetti legs’ Malone got on the end of some patient build-up. Scott Malone celebrates the winner v Wigan. Jack Butland performs heroics to keep out Harry Wilson. The Wigan win could’ve started a 12-point return from four winnable home games, but we ended up frustrated by Sheffield Wednesday and Stoke, for different reasons. The Owls, rejuvenated under Steve Bruce, played their part in an entertaining 1-1 draw. Bradley Johnson scored for the first time this season – even if he is playing for a contract, at least he’s playing. More chances created meant more optimism in the stands, despite two games producing two points, not six. Stoke meanwhile, are a shadow of the team who were Premier League stalwarts just two years ago. The unimaginative Potters sat in for a draw, and got what they came for thanks to the woodwork and Jack Butland’s heroics. Derby did everything but score, and 19 shots on goal was a far cry from the zero attempts at Villa. Whatever happens on the pitch, there’s been transparency from the club this season. Whether it’s Lampard calling out the ‘doom-mongers’ or Mel Morris spelling out our financial constraints, you get the sense Derby are putting their cards on the table (as much as possible) in order to foster a sense of unity from the fanbase. There’s been a particular reaction to Lampard’s ‘negativity’ comments, with home crowds appearing noticeably noisier for longer since he singled out the mystery offender(s). There was certainly no cause for grumbling in our last match of March. Rotherham, even with their hopeless record at our place, have already beaten Derby this season. The subsequent six-goal thrashing, then, was immensely satisfying for the team, the fans and Lampard (especially after his sending off there in September). There were standout performances across the park; Holmes is one of the Championship buys of the season, Tomori goes from strength to strength and Waghorn bagged his first hattrick in English football. The final word though has to go to Mason Mount. Having missed the whole of February and most of March, Derby’s ‘caged lion’ ran the show in the 6-1 win, won the penalty for the first goal and tucked away a neat fourth from Bogle pull-back. He’s a game-changer and we’ve missed him massively. If our rut is behind us, our squad is full strength and everyone’s pulling together, Derby have got every chance in this nail-biting race for a top six place. – Mel Morris shutting down those rumours of being ‘disillusioned’. Media tittle-tattle has derailed us in the past so the fans’ forum was a helpfully-timed chance to nip it in the bud. – Duane Holmes’ mascot bantz: Is ‘the Scunthorpe Messi’ now everyone else’s favourite player to? Only one contender here. I questioned whether he meant it above, but I’ve never seen a goal like Mason Bennett’s in 25 years of watching the Rams. Went deservedly viral and got the team back on track too. Well in, Mason!